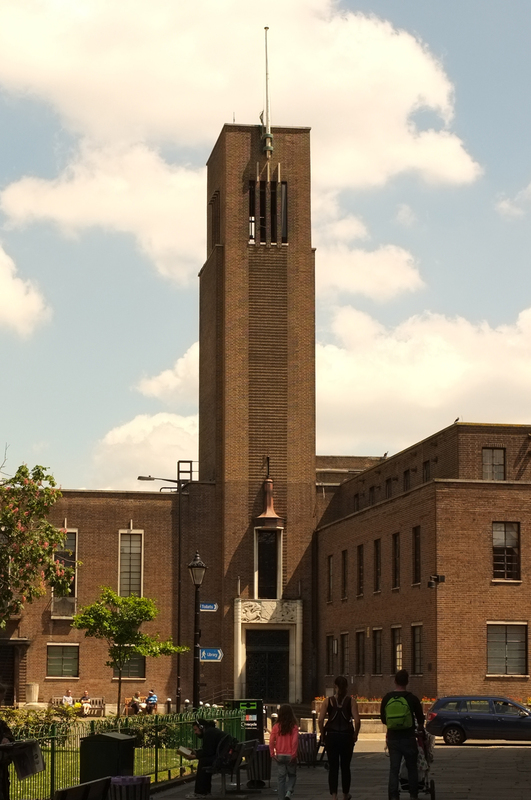 Last weekend I met with some friends in Crouch End and I stumbled across Hornsey Town Hall. I was not aware of the building or its architect, so I decided to take a closer look. The building is very fine, and reminded me of some of the great brick built civic buildings I visited in Holland – in particular Dudok’s Town Hall in Hilversum. I was shocked to learn that this building has been vacant for decades, abandoned when the borough of Hornsey became part of the larger Haringey. 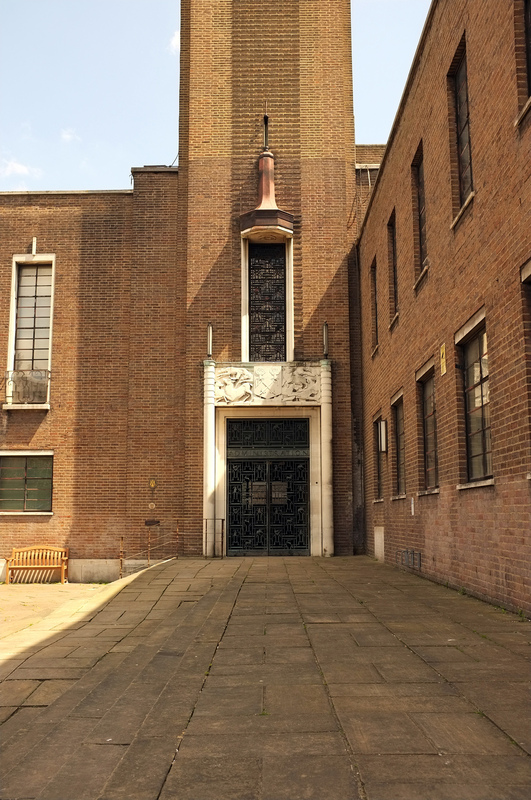 Built in 1930’s by Reginald Harold Uren, the complex occupies a narrow, deep site. Extending from the Broadway – a busy Victorian high street – into the residential neighbourhood behind. The town hall is the centrepiece of the scheme, and is situated to the back of the site, facing the Broadway. It is flanked by two simpler blocks, formerly the gas and electricity utilities offices, with a public square captured between. The placement of a single tower at the southeast corner of the square emphasises the asymmetry of the composition. 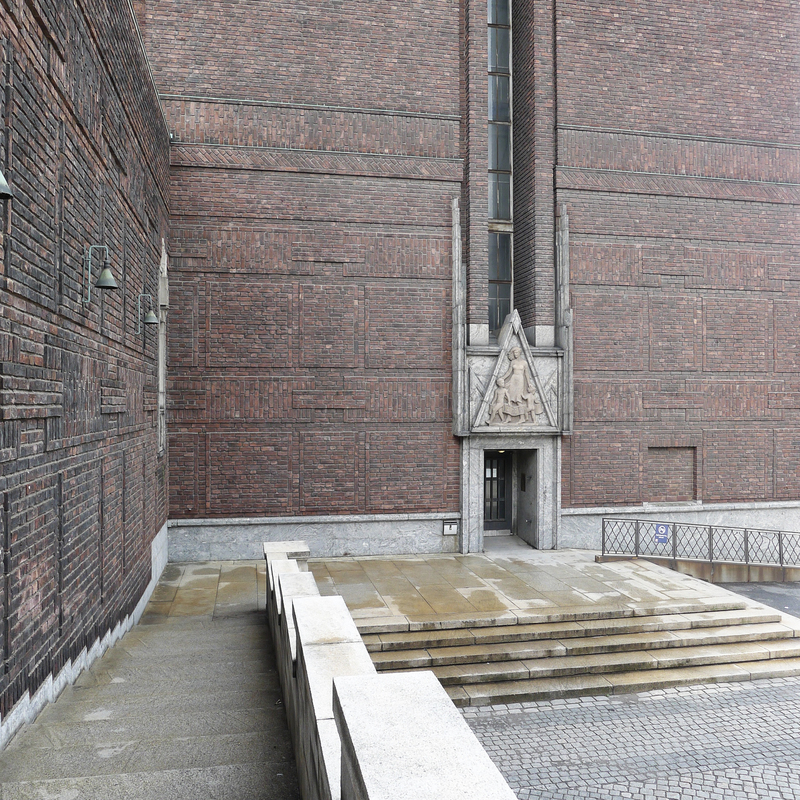 The brickwork is mostly flat and very consistent in tone, giving the building a massive, monumental quality. This flatness is punctuated with rows of carefully proportioned windows and moments of detailed stone and metalwork. A row of slender full-height windows, framed in stone, light the public foyer and face onto the square creating a suitably impressive civic frontage. A ladder of projecting brickwork reinforces the vertical emphasis of the staircase tower. 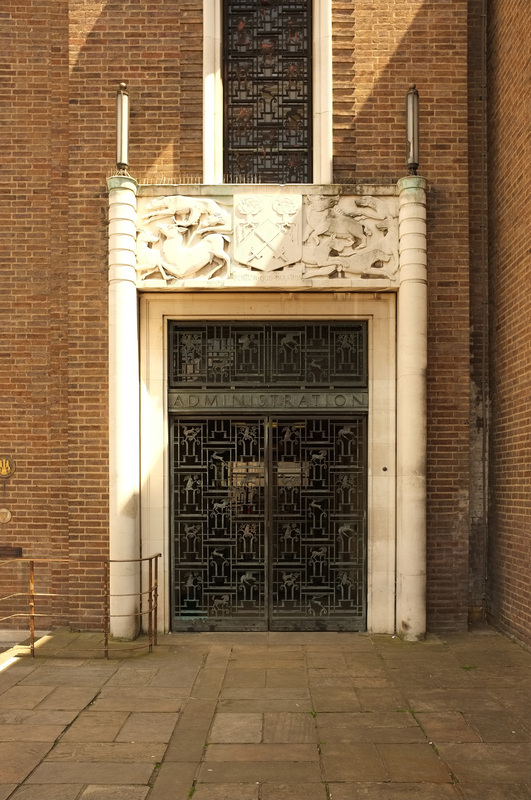 At the base of the tower, detailed and richly ornamented stonework by sculptor A J Ayres frames the rather grand formal entrance to the council offices. 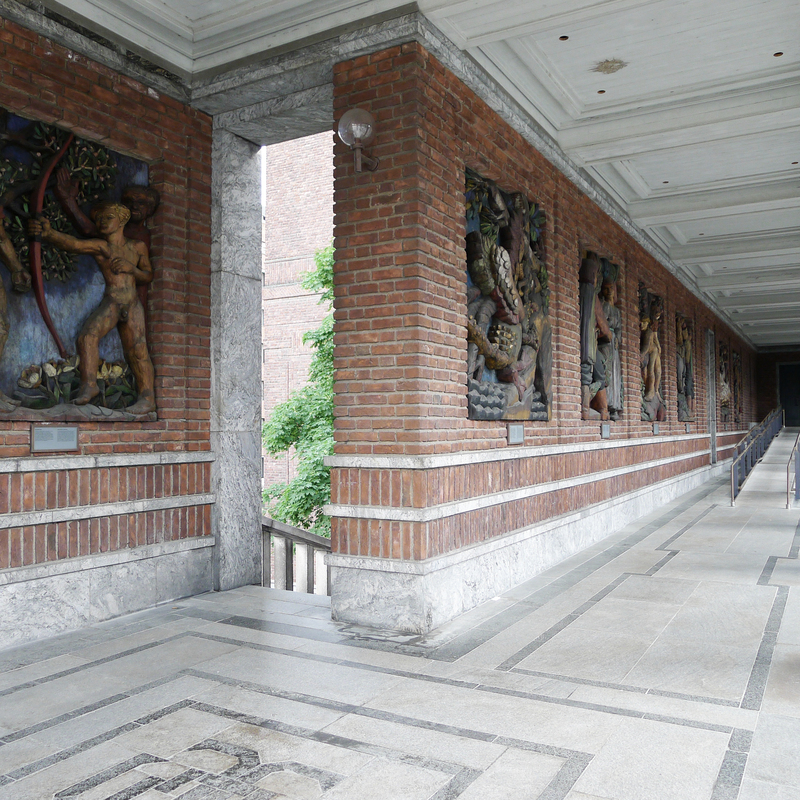 The entrance to the public hall is placed on the central axis of the public square. It is larger but more simply defined, with three large openings formed in brick and covered by a ceremonial balcony above. 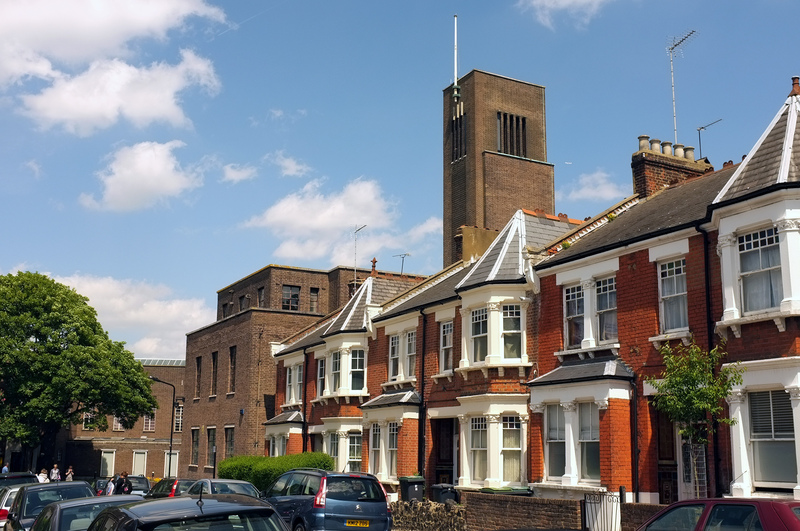 When I returned the next day to photograph the Town Hall, I caught the attention of a local photographer – Roelof Bakker – who happened to be enjoying the sunshine in Crouch End at the time. He was kind enough to give me some history on the place. Roelof was lucky enough to get inside, to photographs the interior for a collaborative project to bring life back to abandoned spaces. 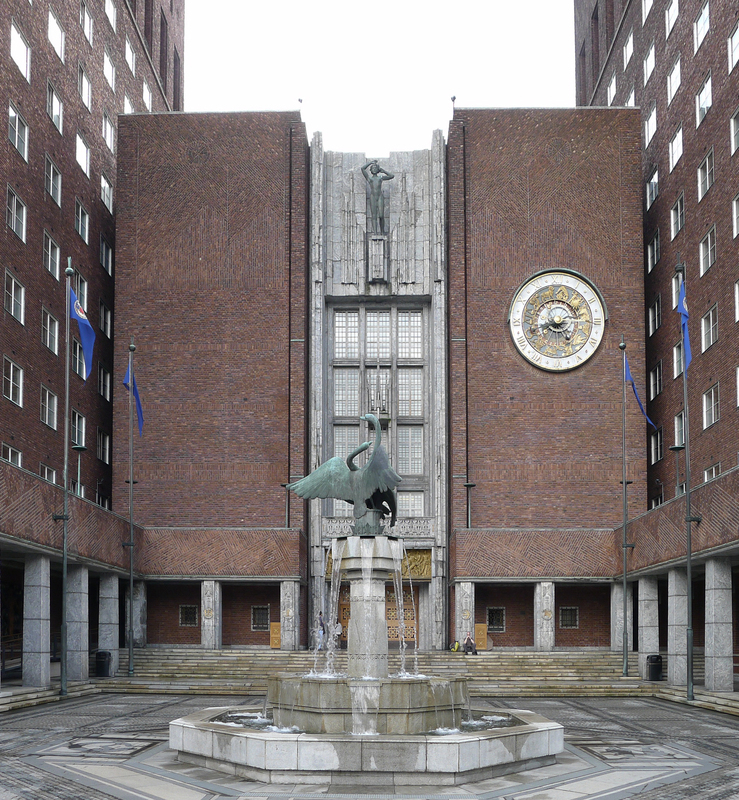 Another municipal building we both admire is the Oslo city hall – also built in the same era. 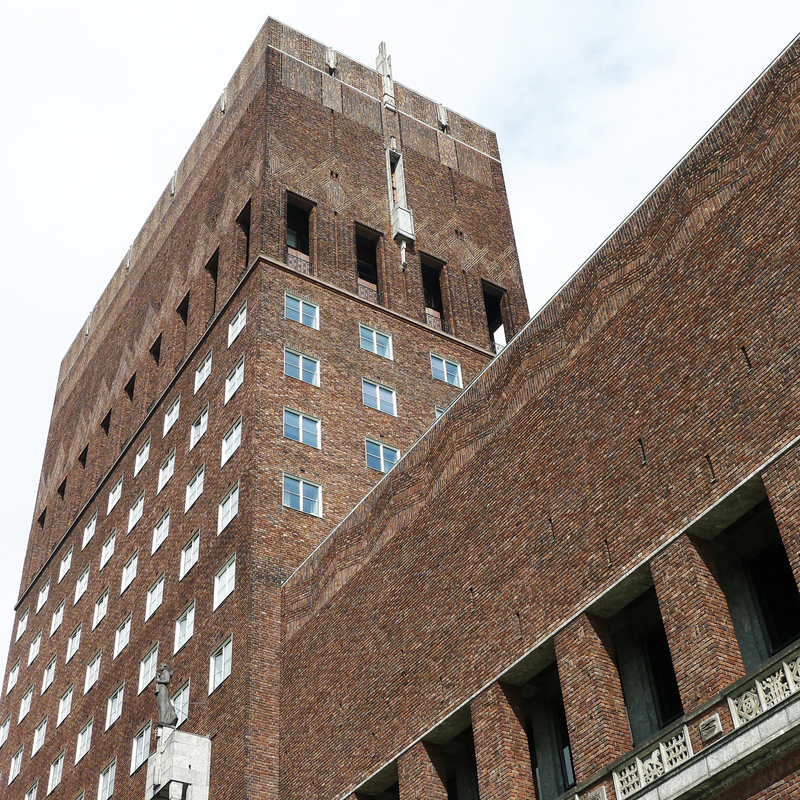 Constructed between 1931 and 1950, by architects Arnstein Arneberg and Magnus Poulsson, it was an ambitious project in a period when means were scarce. 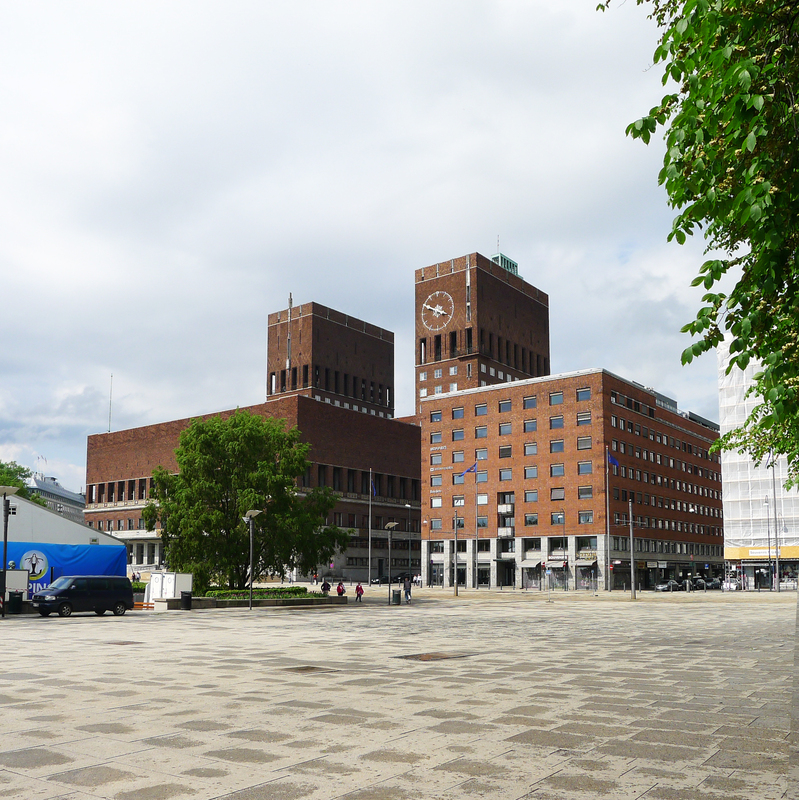 The city hall features two large towers with offices and ateliers that flank the monumental entrance to the city while its interior halls and larger formal rooms are housed in a lower volume with a view over the Oslo fjord. 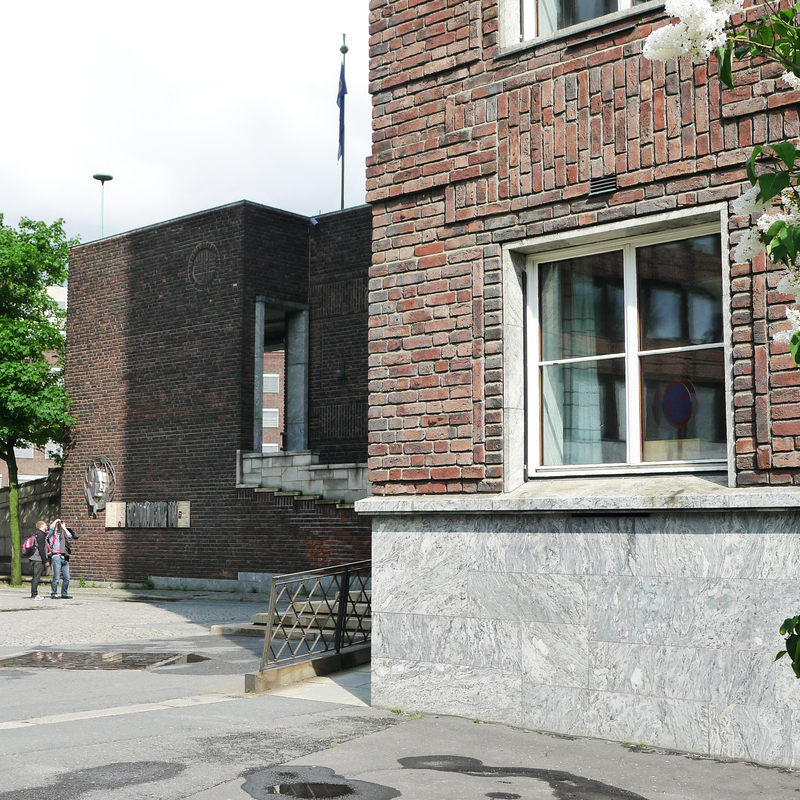 There are several affinities between the Hornsley and Oslo buildings. 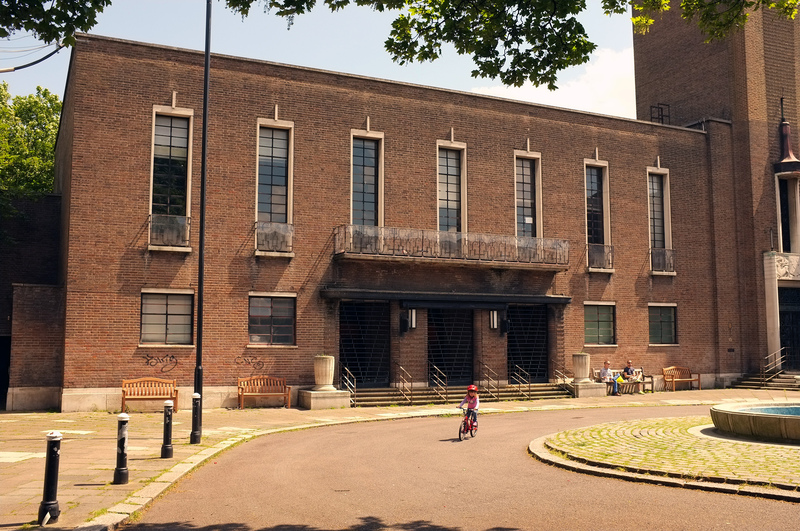 Not only the period in which they were realised and their early modernist style, but not the least the intricate brickwork and the way artwork is bound within the architecture. 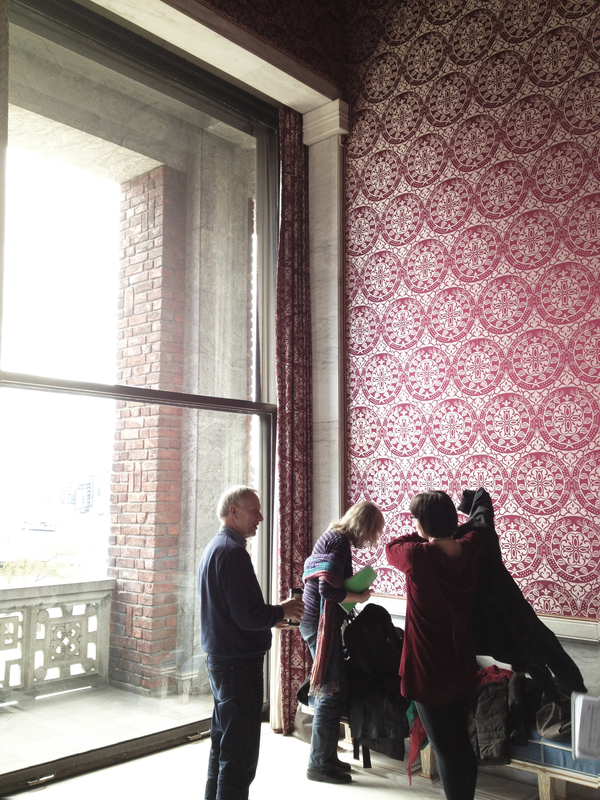 The brickwork in the Oslo city hall has fascinated me since I first saw it. There is a richness in the rough bricks and wide mortar between them and the variation in patterns in which they are put together seem endless. The brick varies in size from the standard to an oversize length and an oversize overall size. The mortar between the bricks is wide, about 25mm which makes the texture of the building more alive and visible in correlation to its large scale. The building from afar looks quite stern and simple but the closer you get the more play and extravaganza you see both in the brick patterns and the integrated murals and motifs closer to the entrance levels. I leave in one taste of the interior which deserves to be addressed in its very own post at a later date!